Tomorrow morning I’m headed for a 2-day tenkara event, and next week my schedule is packed. I hope to write more soon, but thought I’d leave you with a post of fishing before I go. 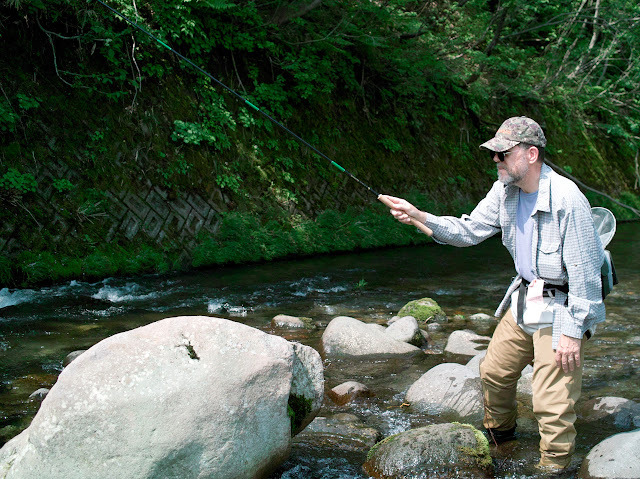 This time I want to also share a few Japanese terms for specific types of stream, or terms that I use very often to figure out where to go fishing. Like the often cited example of eskimos have 30 words for different types of snow, the Japanese culture also developed a good vocabulary for describing their streams. To complete the post, I’ll include a couple of my best fish shots so far. 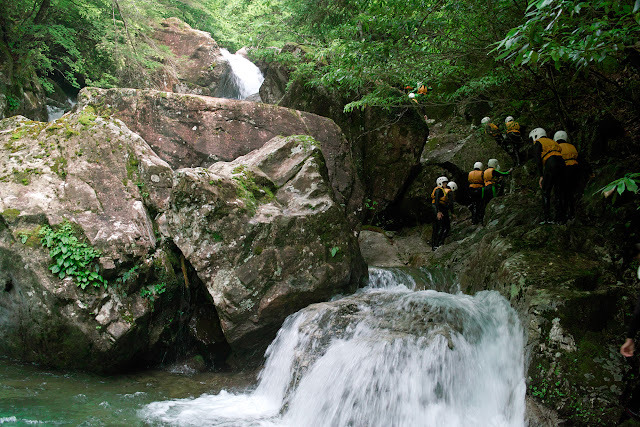 Japan has streams of many different kinds. The general term for river is “kawa“, but there are other more specific terms to describe different streams. Kawa can be “honryu“, which is the main stream, or “shiryu“, which are tributaries. Of course, a shiryu can also have other shiryus… Two other terms I use very often are “karyu“, which means downstream, or “jiuryu“, which means upstream. Some are small, boulder strewn mossy streams. 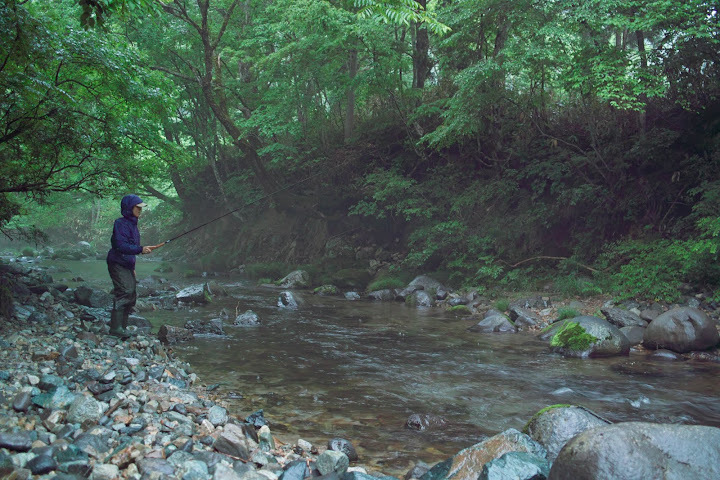 These are normally called “sawa“, the term for small streams, such as the one Yoshikazu Fujioka-san is fishing below, and my host Ikumi is fishing below that. 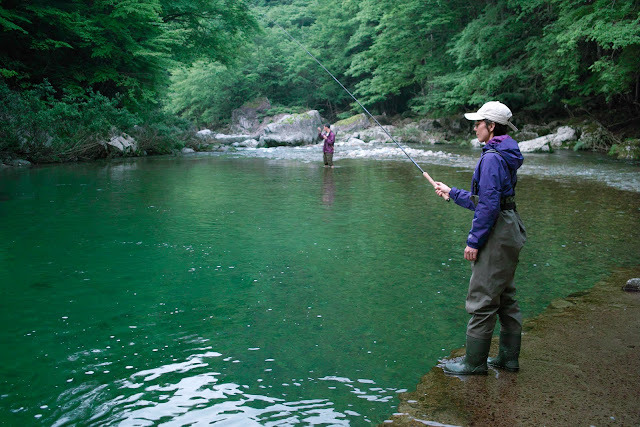 I’ve been teaching Ikumi tenkara fishing and am very proud of how good her form is. We’ve only been out 3 times and her casting precision and technique impress me. She caught a fish on this evening (yumazume = evening activity period), Rocky and I didn’t. Mountain streams in general are called “keiryu”. 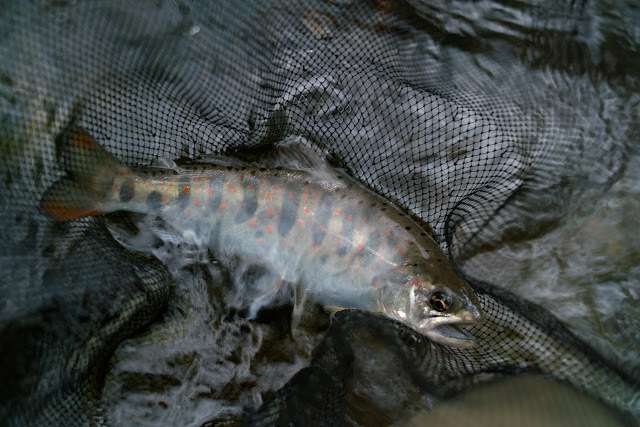 The keiryu below is being worked by Chris Stewart, the “Tenkara Bum”, who is referred by our Japanese friends as “tenkara baka”, though we’re still unsure that’s the best term for a bum. 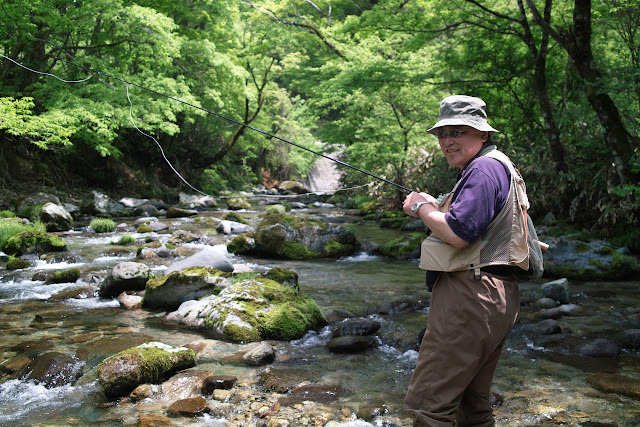 This was the “shiryu” to the Itoshiro, which is the “honryu” in the area we fished and one of the few catch and release streams in the country. Keiryu also come in different styles. The clearest ones are called “seiryu”, which indicates they are “clear/beautiful/moving water types of streams. They may be large or small, but have the characteristic features of a mountain stream, boulders/pockets/currents. The Mazegawa is referred to as a seiryu. The Mazegawa has at least 100 distinct parts, that feel like entirely different streams. The one picture below shows my hosts, Ikumi on the foreground and Rocky farther downstream. The pool in front of her is about 12ft deep and we could easily see every rock below. Some are large, slower rivers, these are just normally referred to with the general name “kawa/gawa” – there may be a more specific term, but I still haven’t learned it. The picture below was taken in Gujo soon after the ayu fishing season started. I’ll write more on ayu fishing later, but for now, suffice it to say it’s not tenkara! It’s done using a live “decoy fish”. It’s definitely a serious activity here. I may even call it “the bass fishing of mountain streams”. The fish here are just gorgeous, when I can see them I get excited about fishing again. In this area we can catch Iwana, and Amago. On the Japan sea side, one may find the yamame. Next week I have an outing scheduled with a local whose favorite stream is a couple of hours away and we can catch yamame. This is a picture of a Iwana, my best fish on this trip. It’s not the largest fish one can catch here; last week on the ryokan I visited, the owner had a beautiful mounted display of a 20.5inches (52cm) Iwana. The Fishing Center has a dried 25inch Iwana on their wall. Tenkara was also used to catch some large fish. 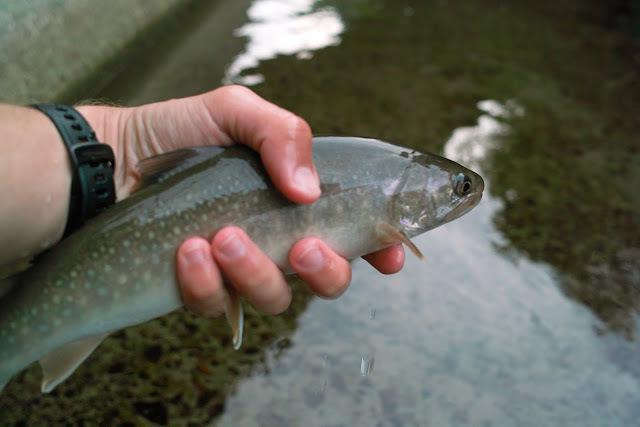 Here is an amago I caught on a “shiryu”, the term for tributary. Notice the small red spots, the differentiating mark between the amago and the yamame. I hope to have a picture of yamame next week. Thanks for the definition of terms. I often see those words in the URL string. Now I know what they mean and know if it is a link that will tell me something I want to know about.